Madame Zola, an Ann Arbor palmist who often dispensed common sense and ■ motherly advice with her showmanship, died yesterday after a long illness. The palmist, Mrs. Johanna M. Webb, had worked circuses and f airs around I the country for 27 years. She was 65. She is survived by her husband, I Charles, who resides at 2735 S. Wagner I Rd., a son, Harold, living in Chapel HUI, Inc, her mother, Mrs. Marie Burkhard I and a sister Mrs. Lena Brickman, both ■ of Bronx, New York City, and two grand children. Mrs. Webb got her start in circus performing in 1933, when she married her I former husband, who worked with a I Ringling Brothers' circus. Untrained, she was added to the "statI ues" act, in which employees wives and I children who had no circus act of their I own would be painted with gold paint m and pose as "statues." S After six years, she left the show with 'M her son and worked with a family set■ ting up their own sideshow. The wife, I who was a fortune teller, taught Mrs. 1 Webb her skills. H Letters and mementos of Madame ■ Zola's career, which fill the Webb's I house trailer, bring back names famous ■ in the circus world - Clyde Beatty, for Whom she worked seven years and Otto B Greibling, the famous clown. She has ■ read the palm of Yul Brynner and Robert Goulet. Mrs. Webb disliked the elaborate turbans and costumes worn by others of I her profession in the thirties and forties, I her husband says, and preferred to wear I a black gown with a large red rose. 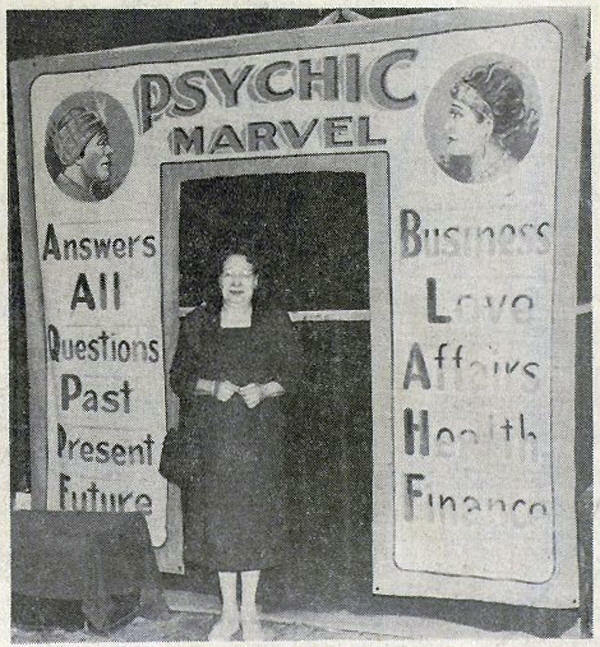 She I billed herself as a "psychic marvel" I who "answers all questions." She believed in giving something of I value to each customer, and fitted her I conservation to their needs. One time, I her husband recalls, while she was I working in Toronto a young man carne I to her and told her he could not keep a I job. Her "psychic" advice? "Go to I night school." The young man asked her I what he should study and she told him I the first thing that came into her head I - "take Frenen." About two years later, the boy visited her again. He had a job and a new suit, I and had just returned from a pleasure I trip to Paris. Mr. Webb doesn't recall what his job 1 was, but feels his language ability was I one of the qualifications. "If his mother had given him that I advice," Webb points out, "he never I would have listened." Madame Zola married Webb, a circus I electrician, ' ' c a n v a s s man" and I superintendent, in 1948. With him she operated concession stands at many small circuses, a minstrel show and a country show. They learned about Ann Arbor, where they have lived since 1955, from Mrs. Catherine Greene, a local woman who ran a boarding school in Bloomfield Hills which their son had been attending. When the school folded, they moved here so he could have uninterrupted schooling. H e attended University School, graduated from the U-M, and is now working on his PhD. at the University of North Carolina. Mrs. Webb worked the Toronto Exposition and the Shrine Circus in Honolulu up until this march "selling nothing but her personality and conversation," her husband says. In Ann Arbor, she became deeply involved in civic affairs. She held several offices with the League of Women Voters, and was a member of the Friends of the Ann Arbor Public 'Library, People to People and the Michigan Showman's Association. She was a board member of the Medical Care Facility Auxiliary and the Alliance for Progress. Says an Ann Arbor friend, "When I heard she was a palm reader, I couldn't believe it." Mrs. Webb also worked as a secretary at Mott Children's Hospital and the U M Dental School. "She was a great one to be informed about everything," her husband remarks. "As a fortune teller, she had to be able to talk to anybody about anything, and give them useful advice." Mrs. Webb also ran a one-woman people-to-people program for University students from Thailand. Her husband recalls dinners at which 15 students were crammed in their small trailer. Dolls and elephants, many gifts from Thai students, now ring the living room. Funeral services will be held at 2:30 p.m. Monday at the Muehlig Chapel with R e v. Michael Mutzelburg officiating. Cremation will follow. Friends may call at the chapel after noon on Saturday. Memorial contributions may be made to the Medical Care Facility Auxiliary in care of Mrs. Ralph Berry, 1708 Ferndale Place.